The late sport psychology pioneer Dr. Ken Ravizza discusses what coaches can do when faced with the situation where a team is playing poorly and no one seems willing to step up and get things turned around. First, the team must recognize that is what's going on. The coach has to communicate that to the team if they aren't already aware. Recognition of the problem - whether the coach communicates it to the players or the players recognize it as a group is the first step. Next, they need to focus on the task at hand in some way. This could be the next point, the next play. Get back to the next segment of the game. The tendency often is for the players to start viewing the game as a whole and that gets them into trouble. It can be the first 10 points and they start seeing the scoreboard at the end of the game, versus focusing on the next play. Third, athletes need to immerse themselves in what they are doing. Here athletes make sure they are in control of themselves, they have a clear thinking plan, and trust what they have athletically. Trusting in one's ability is key. It's the old argument - what comes first, confidence or success? When you have confidence, success will eventually come. The issue becomes taking whatever confidence level an athlete may have and going out there and doing battle with it. Practice must serve as the time to deal with this issue. Work on turning around poor situations during practice. When the team is having a bad day in practice, what a wonderful opportunity to work on this. Call a time out in practice and decide what will be done when you encounter this situation during a game. When the team is not dealing with the pressure of a game is the best time to learn how to overcome poor performances. 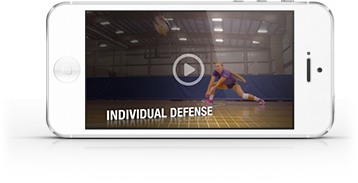 When players know what they will do to handle the situation when it arises during a game, they now have a reference point to relate to. The coach can say, "Remember that day in practice when things weren’t going so well? We turned it around in practice, now go out there and do the same thing." Peak performance is not about being perfect all the time. They can get into the zone, ten to fifteen percent of the time, if they are lucky. The rest of the time is compensating and adjusting. Learning how to compensate and adjust during games happens during practice. The leadership thing is critical. Sometimes coaches can get spoiled when they have one or two really good team leaders. When great leaders graduate, they often leave a vacuum. If no one is stepping up, it becomes imperative for coaches to take more of the leadership role. Depending on the individual, feedback can be given using a kick in the pants or the warm fuzzy approach. The coach that uses the "one size fits all" approach in dealing with his or her players inevitably becomes very ineffective. They tend to lose connections with their teams. Some players really like it when the coach gets in their face a little bit, others don't. What has proven to be an effective exercise in the past is for coaches to ask players, "Who is one coach you really loved playing for? How did he or she motivate or communicate with you? What did they do that you liked?" This will give the athlete the perfect chance to tell how they best respond for motivations - both during games and in practice.